If you would like to commission your own work of art, please contact me to discuss your requirements. 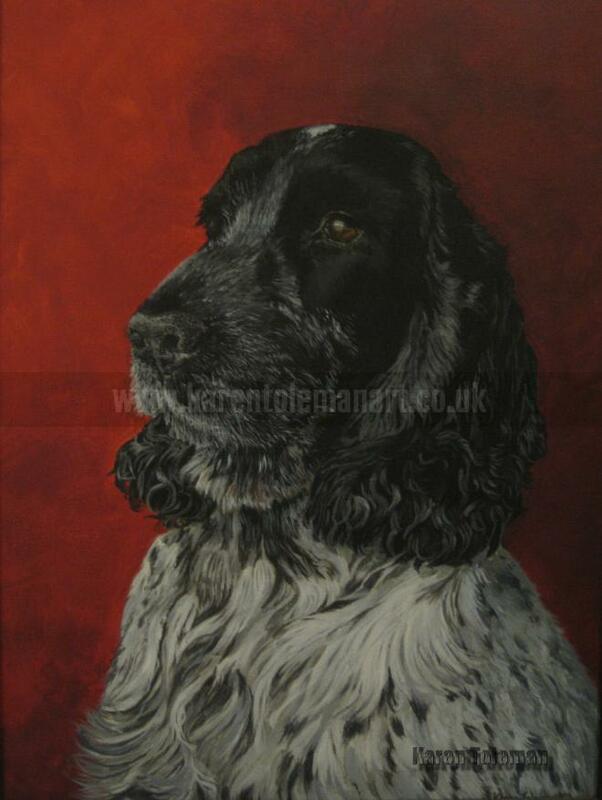 I am happy to accept commissions on a variety of subjects including pets, domestic animals or a photo or view of which you may be particularly fond. Prices start at £220.00 for a single pet portrait in oils with a plain tonal background, as illustrated by the acrylic painting of my own cocker spaniel Abbie shown in the right. If the portrait is for yourself and you know where you would like to display it, background colours can be chosen to suit your décor. Whole body, multiple portraits and detailed backgrounds will incur an extra charge depending also on the size of the canvas used. Sizes start from 14” x 10”(approx. 36cm x 26cm) up to 30” x 24” (76cm x60cm) or larger if required. See my information page for further details on materials used etc. Photographs can be emailed to me or sent by post; if the latter, it is advisable to take copies in case your originals are damaged in transit. All originals will be returned to you. If you live locally and would like me to take photos of your subject for you this can be arranged. Detailed photographs are a must, in order for me capture a proper likeness and the personality of your pet. Photos can also be amalgamated i.e. a portrait of your pet set against your garden or a particular landscape in the background. Graphite (pencil) drawings start from £85.00. Giclee prints and greetings cards featuring your artwork can be purchased to order.